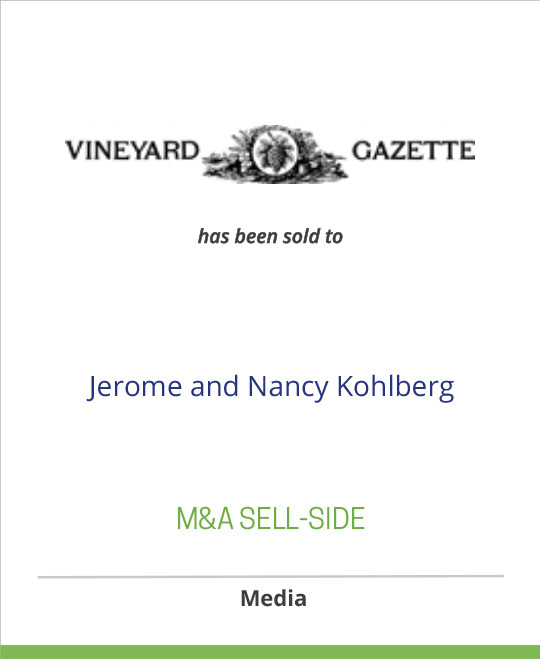 DeSilva+Phillips, Mediabankers announces that its client Vineyard Gazette, the family-owned weekly newspaper that has been covering Martha’s Vineyard for 164 years, has been sold to longtime seasonal residents and philanthropists Jerome and Nancy Kohlberg. Also included in the transaction were Martha’s Vineyard Magazine, Martha’s Vineyard Magazine Home and Garden, Island Weddings magazine and Best Read Guide. The Kohlbergs have established The Martha’s Vineyard Gazette LLC and will be taking over management of the paper from the Reston family who have owned and run the paper for 42 years. James (Scotty) Reston, the Pulitzer Prize winning New York Times columnist, bought the Gazette in 1968 from the Hough family, and he and his wife Sally Fulton Reston owned the paper until they passed away in 1995 and 2001 respectively. Beginning in 1975, Mr. Reston’s son Richard and his wife Mary Jo began working for the paper, and in 1988 they replaced the senior Restons as publishers. In 1999 Mary Jo retired and Richard continued as publisher until the completion of this transaction. He officially retired from the newspaper upon the publication of Friday’s edition (November 26, 2010). Richard and Mary Jo Reston, and his brothers, author James Reston Jr. and lawyer Thomas Reston, were co-owners of the Gazette prior to its sale to the Kohlbergs. Mr. Kohlberg is well known on Wall Street where he was formerly a partner in the investment house Kohlberg Kravis Roberts; he left the company in 1987 and founded his own company and later a charitable foundation which is based in Mount Kisco. Mrs. Kohlberg owns an organic restaurant in Westchester County that began serving farm-to-table fare long before it was in vogue. They have four grown children, 13 grandchildren and two great-grandchildren, one recently born on the Island. Their Vineyard ties date back to 1943 when Mr. Kohlberg first came to the Island. Mr. and Mrs. Kohlberg have been longtime seasonal residents of the Island who live in and operate businesses from Mount Kisco, N.Y. The Kohlbergs have been quiet philanthropists on the Vineyard for many decades, especially in the areas of conservation and education.